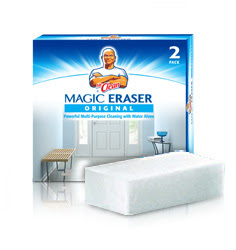 My vote for the most innovative and life-changing invention of the 20th century absolutely goes to the Mr. Clean Magic Eraser (or maybe the computer...). These little white scrubby sponges don't look like much, but that's what makes them magic. You get them wet, squeeze out the extra water and then scrub at whatever dirt or grime or stain is vexing you, and it will absolutely disappear, amazing you and anyone who happens to be watching you clean. I use mine for everything- it's especially great for dings and marks on the walls (it won't hurt your paint job) and dirty fingerprints on cabinetry, but it got rid of the discoloration on the inside of a coffee mug, cleaned the caked-on junk on the inside of my oven, and even gets rid of the sticky glue that price tags and labels leave behind. Sometimes I just walk around my apartment with one of these things and look for impossible tasks it can amaze me with. And, yes, I hum the Mr. Clean song while I do it. My vote for the greatest cleaning invention (although it's SO hard to find): Dawn Power Dissolver. You could leave all your cooking pots with all the burnt stuff for days & just spray this magic on the the pots, wait ten minutes and it rinses right off. Brilliant, really. Mr. Clean has done it again- I love these things!!!! The last of a dying breed (or the first of a new breed), I am the only 29-year-old housewife I know. I cook, I clean, I bake, I sew, I make things from scratch. Care to join me? Dough you hear what I hear?